Network calls can be made via a fake API client or fake server that immediately returns data from files stored on disk instead of hitting the network. This bypasses the network’s latency and flakiness as well as any errors originating on the real server. connectedProdDebugAndroidTest will use the real APIs and sensors so they might fail from time to time. If you have a Continuous Integration system, this task could be executed every night or used manually as a acceptance end-to-end test. 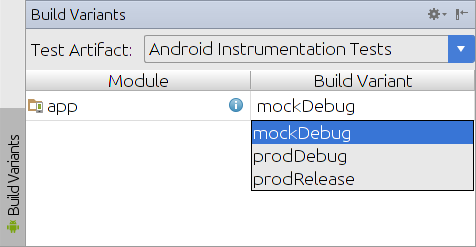 Note that this task will run the tests in androidTest even if androidTestProd doesn’t exist.